Rafale | Rafale French Fighter By Dassault Aviation | Dassault Rafale . The Rafale is a multi-mission, multi-role air superiority fighter plane designed and developed by French company Dassault Aviation. Over a period of last decades, The Dassault Rafale has proved of combat capabilities with an excellent track record of performance. The Dassault Rafale has also emerged as the most preferred choice for multirole fighter plane and recently bagged many international orders amongst most fierce competition. In today’s modern warfare, the air superiority over your adversary is a major strategic advantage and plays a crucial role in deciding the fate of the war or achieving the mission objectives. Historically, the nations with a modern air force that can enforce the air superiority have always won the war, even with the relatively smaller size of the armed force. During the late 1970 the existing ageing aircraft such as Mirage 2000 in service with French Air Force and navy needed to be replaced with modern contemporary technology planes . In order to save the development time , share the project development cost and technology and to facilitate future sales , The French government decided to join the consortium of four countries which includes Germany , UK , Italy and span which was already working on the project Eurofighter Typhoon. However as the work progressed on this consortium project , the disagreement immerged on many issues and the French government decided to exit from the Eurofighter Typhoon project and started working on building its own project . The France started the work on the project for its own fighter plane and the first prototype of “Rafale Fighter” was ready in 1986 for the technology demonstration. The French companies already had prior experience in the design and development of state-of-the-art Mirage 2000 which is also a delta wing formidable plane still in active service with many countries. And therefore, the French companies had the advantage of already developed technological base for many critical technological areas such as Radar , Engine , Avionics , fly-by-wire technology and weapon systems . The Rafale canard-delta wing design is basically an aerodynamically unstable aircraft and therefore this design needs a digital fly-by-wire flight controls to artificially enforce and maintain the stability of the aircraft with the help of onboard computers. However , In terms of technology , the Dassault Rafale is in a class apart. The “Rafale Fighter” incorporates latest avionics and features, such as Direct Voice input, the RBE2 AA , Active Electronically Scanned Array ( AESA ) radar and the Optronique Secteur Frontal ( OSF ) , Infra-red Search And Track ( IRST ) and all these new technologies had to be specially developed by French companies for the Rafale project . The French companies had developed all these technologies indigenously without any external assistance. Although, the “Rafale project” did suffer some setbacks and delays due to project cost cuttings and budget cuts in the post cold-war era. It was indeed creditable for the French companies to entirely design and develop a 4.5 plus generation plane within such a short span of time on its own . The “Rafale Fighter” has turned out to be amongst the finest and the best in its class of fighter aircraft. The Rafale is multi-role and multi-mission state-of-the-art fighter plane which is stated to be 4.5 plus generation . The Dassault Rafale design is based on canard-delta wing and powered by two engines . The Rafale has been designed and developed by French company Dassault Aviation which has an excellent track record of producing both world-class military and civilian planes. Engine : The “Rafale Fighter” is a twin-engine aircraft which is fitted with two Snecma M88 engines. Each Snecma M88 engine is capable of producing up to 50 kN of dry thrust and 75 kN with afterburners. Radar : The initial variants of Rafale were first fitted with the Thales RBE2 passive electronically scanned multi-mode radar . However , later on these radars were replaced with latest RBE2 AA Active Electronically Scanned Array ( AESA ) radar . The “Dassault Rafale” has been specifically designed for both Air-to-air and air-to-ground roles and the Rafale has been marketed as an “Omnirole” to describe the effectiveness of the aeroplane in both the roles. As compared to Eurofighter Typhoon, the Rafale Fighter doesn’t have as much as the thrust-to-weight ratio of the Eurofighter Typhoon, But the Rafale far exceeds it in terms of payload and strike radius. And Rafale can effectively perform both the roles reasonably well. 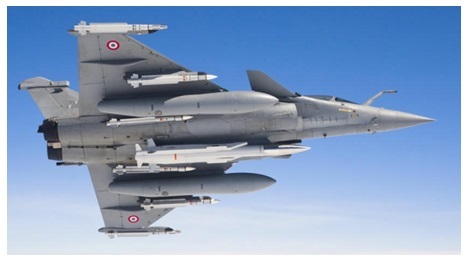 The Rafale’s ground attack capability mainly depends upon the sensory targeting pods and other integrated systems and that includes Thales Optronics‘ New Generation pod , Areos reconnaissance pod and Damocles electro-optical and laser designation pod. The integration of these sensor pods together provides all the required information to the pilot to get a lock-on to the target and provides the ability to conduct tactical reconnaissance missions. This sensor pods system is also integrated with the Rafale’s IMA architecture necessary for sharing the real-time analyzed data and other information feeds to ground stations, friendly units as well as other pilots part of the formation. The Rafale is also equipped with sensors for ground attack role and the scalp missiles which can strike ground targets up to 300 km with pinpoint accuracy . For long-range ground attack role , the “Rafale Fighter” is equipped with SCALP EG Air-To-Ground missile and has an effective range of 560 KM. The SCALP EG missile is manufactured by MBDA . The Dassault Rafale is a formidable opponent in both close and long range dogfight situation. 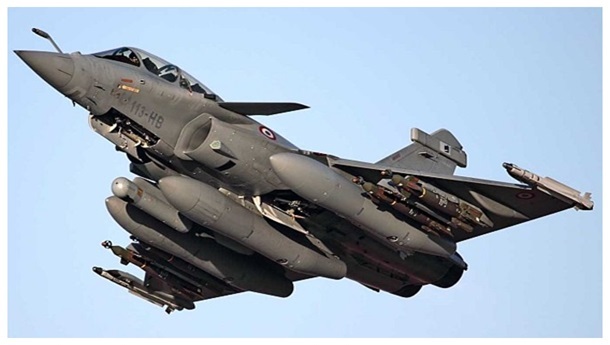 The Rafale fighter is well equipped with latest AESA radar , extremely potent air-to-air missiles which includes short range , medium range and very long range BVR missiles to effectively engage and neutralize all kinds of aerial threats. The Rafale incorporates several passive sensor systems to effectively perform air supremacy role . The or. The Rafale fighter makes use of Optronique Secteur Frontal ( OSF ) which is a front-sector electro-optical system developed by French Thales. The OSF system is completely integrated within the aircraft and can operate both in the visible and infrared wavelengths.The OSF enables the deployment of infrared missiles such as the MICA at BVR – Beyond Visual Range distances . The “Rafale Fighter” is now equipped with METEOR BVR developed by MBDA. The Meteor is an active radar guided BVR – Beyond Visual Range air-to-air missile that is capable of engaging the targets at very long distances over 150 KM. It has a “No Escape” zone of 60 KM which is the largest amongst the contemporary BVR missiles. The Meteor Missile can be effectively used against a wide variety of targets such as fighter jets, Cruise Missiles, UAV and other airborne targets. The Meteor is considered to be the best BVR Missile in its class and a complete game changer. France : The “Dassault Rafale” is currently in service with French Air Force and navy . Egypt : Egypt became the first international customer and purchased 24 Rafale Fighters. Qatar : Qatar became the second country to purchase 24 Rafale in 2015 . The “Dassault Rafale” is a 4.5 plus generation “Omnirole” Fighter jet developed by French aviation company Dassault Aviation. The Rafale fighter has demonstrated its combat capabilities during various operations by French airforce. The Rafale is a formidable fighter jet very well equipped with a various sensor and the weapons package capable of performing both airto-air and air-to-ground effectively .